Lasers at Chew have traditionally been a strong fleet and ex members include Keith Wilkins and Chris Gowers. Current members include past and current champions at both European and National Masters level, backed by a strong racing fleet of over fifty boats taken from a current fleet of around one hundred and twenty five lasers. There are usually in excess if 10 Lasers on the start line on a Sunday, and 25-35 on Wednesday evenings, with a full range of abilities. So, whether you’re a hot-shot or a beginner you are sure to have someone to race against. In order to encourage sailors into racing and to progress skill levels generally, there are several Laser race training days each year. These cover the whole range of racing techniques such as starting procedures and tactics, sail settings, boat handling, rigging, rules and tactics. Each session has a mix of classroom and practical sessions, depending on the weather. They are generally conducted by one of our very own top-level sailors and we sometimes have guest coaches. Our regular sailors are also happy to give advice on any other race day. Just ask! We are a social and friendly fleet, with various events throughout the year including cycle rides, skittles evenings and sailing weekends away which usually include a visit or two to the local hostelry. 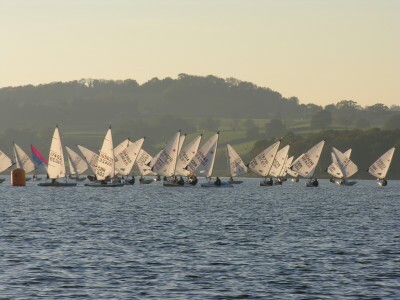 The club regularly hosts major national championships, such as the Laser Inland Championships, and our annual open meeting is on the Wessex Grand Prix traveller series.